On Saturday March 26 a Black Belt Grading was held at Williams Family Karate Academy with 3 candidates attempting the rigorous grading for Shodan and one junior candidate attempting the grading for Shodan-Ho.The grading was challenging both physically and mentally and all candidates showed excellent focus and spirit. 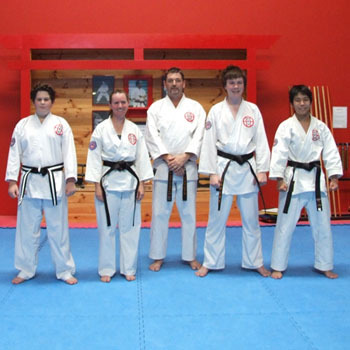 Jason was awarded Shodan-Ho (provisional Black Belt), Sally, Taiga and Haiden were awarded the rank of Shodan (1st Degree Black Belt) by Mike Williams Shihan. Jason joined the Academy at aged 5 and has trained hard for 8 years to achive his current rank which is a fantastic effort! Haiden was also a young starter and trained for 7 years to reach his goal of Shodan which is another great example of dedicated training. Sally and Taiga trained for 5 and 4 years respectively to reach the Shodan level. Well done to you all!